The National Diving & Activity Centre will be open for Scuba Diving throughout the School Easter Holidays, Monday to Sunday. These special opening times will run from Thursday 29th March until Sunday 15th April, before returning to normal opening days/times. Due to the high winds predicted on Saturday 17th & Sunday 18th March 2018, we have taken the decision to close the Wire Zip Slide and Giant 3G Swing for the weekend. Anyone with a booking for the day will be contacted by phone or email. 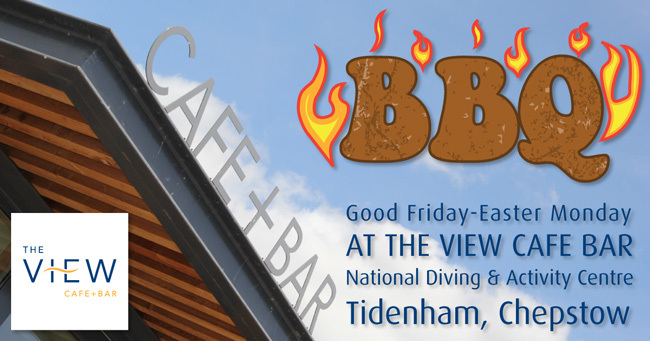 We will be firing up the BBQ on the decked veranda of our View Café Bar over the 2018 Easter weekend. Our delicious BBQ menu will be available from 11:30am – 5:30pm on: Good Friday 30th March, Saturday 31st March, Easter Sunday 1st April and Easter Monday 2nd April. Why not pop in and enjoy a meal from our BBQ menu and enjoy the stunning views over the quarry lake. This week saw the launch of a brand new trailer for our Halloween event, FearFest-Evil… The Rising! During the nights of pure terror the FearFest-Evil team will take you on a terrifying journey through waves of anxiety-inducing, heart-pounding horror experiences! The Scare Zones feature hordes of gruesome characters, stunning sets and spine-chilling performances, FearFest-Evil presents a no-holds-barred night of horror and pure entertainment. Standard Scare Package Tickets are just £25 and available now. FearFest-Evil is strictly for over 16 year olds. The Halloween Horror Event runs across selected nights in October 2018, from Friday the 12th and including Halloween, tickets and full details are available from the FearFest-Evil website.